While Nokia's partnership with Microsoft will undoubtedly present some attractive prospects for phone-buyers, there's one cohort that's not too happy about the news: the employees in Nokia's Finnish offices. According to a Finnish newspaper, over a thousand employees left the Nokia offices in Tampere and Oulu this afternoon in protest. The employees exercised their option to work flextime, streaming from the offices ostensibly in protest to the killing off of Nokia's Symbian operating system in favor of Windows Phone 7. 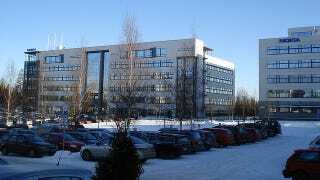 According to the report, there are some 3000 total employees at Nokia's Tampere office, with roughly 1500 of them working on Symbian. Roughly another thousand work on Symbian at the Oulu office. Though the partnership with Microsoft could indeed pay off in the long run, it's no surprise that Nokia's Symbian employees are upset about the news, be it a bona fide protest of a thousand workers or just a few hundred aggrieved Symbian employees taking the afternoon off.